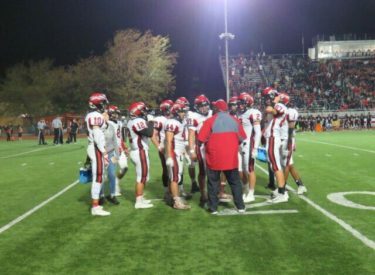 For the first time since Gary Cornelsen was head coach, Liberal has a football victory over Great Bend. The Redskin rallied past the Great Bend Panther 23-21 Friday night in Great Bend Memorial Stadium. It was Liberal’s first win in the series since 2003. The Panthers had won 14 in a row in the series until Liberal’s frenetic fourth quarter comeback. LHS trailed 14-0 after one quarter and 21-7 after three. Cesar Burciaga’s field goal with nine seconds left lifted Liberal. The Panthers scored easily on their first drive as Dalton Miller and the Panthers gashed Liberal with direct snaps including a nine yard TD with 6:24 to play. He had three carries for 41 yards on the drive. Miller added a 10 yard TD with 18 seconds left in the first quarter for a 14-0 lead. The second quarter included a missed Great Bend field goal and a Miller interception on a desperation Syris Dunlap pass to close out the half. But the LHS defense had finally slowed the GBHS attack. Dunlaps 82 yard gallop with 3:59 to play in the third quarter gave the Redskins their first score and made the score 14-7. Miller’s eight yard score was Great Bend’s answer with 16 second left in the third in what proved to be their final score of the night. Dunlap’s 19 yard run with 10:09 remaining made the scored 21-14. Pauncho Terrazas provided an interception taking it to the GBHS 32. That led to a Cesar Burciaga one yard run with 7:31 to play to make it 21-20 after the long snap was low on the PAT and the kick was low. Liberal stopped Great Bend on a 4th and 1 after Great Bend fumbled the snap. Liberal drove down the field for first and goal at the nine. The drive stalled setting up Burciaga’s 23 yard field with nine second left. He floated the field goal from left hash over the south goal posts for the lead. Dunlap rushed for 155 yards and threw for 116. Burciaga added 73. Liberal had 266 yards and Great Bend accumulated 266. But the turnover was key. Liberal is 5-2 and 1-2 in the WAC and Great Bend is 4-3 and 1-2 in the WAC. The Redskins are assured of a winning season for the first time since Steve Warner’s Redskins were 6-4 in 2005. The Skins play at 3-4 Dodge City Friday at 7 with Redskin Pre-game at 6 on 1270 and kscbnews.net.